You will be pleased with the numerous choices for a Las Vegas Mexican restaurant that will suit your taste buds and your wallet. For diners looking for an authentic no thrills taco experience then head to Tacos El Gordo or El Segundo Sol. 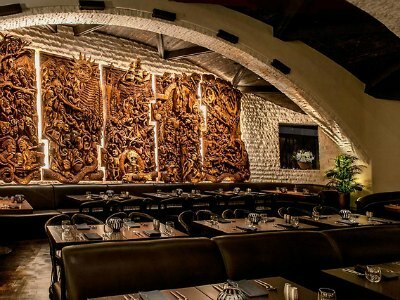 Upscale diners looking for a trendy atmosphere can try the Border Grill and T&T-Tacos & Tequila brings flavors of trendy Mexico City as well as YOLOS Mexican Grill where you will find 60 different tequilas. You can grab a street taco at Canonita while you shop at the Grand Canal or visit Hussong’s Cantina Las Vegas for a margarita and you will find a fine dining element at Javier’s. Families will like the diversity of the menu at Cabo Wabo Cantina as well as the assortment of flavors and the portions served at Nacho Daddy. When you want to have a fine dining experience at a Las Vegas Mexican restaurant that is sure bring your taste buds to life with sophisticated dishes then you should go to Javier’s. Located at the Aria, the restaurant is open for lunch as well as dinner and serves up innovative traditional cuisine from all around Mexico. Once inside you will be treated to plenty of ambience which includes carved woods and a high arching colonial style ceiling accented with a rope style chandelier. The menu features items from several cities such as Callitos Mazatlan (wild scallops), Pescado a la Veracruzana, Cabo Azul (lobster) and traditional dishes such as mole poblano, Michoacan style carnitas as well as enchiladas Suizas. You will find a wide assortment of quality tequilas from white to reposado to anejos which make for a fine sipping while enjoying world class cuisine. The Border Grill is a hip and trendy urban style Las Vegas Mexican restaurant that offers a view of Mandalay Beach while you enjoy innovative takes on traditional dishes. Located at Mandalay Bay overlooking the Lazy River, this establishment is the creation of Food Network stars Susan Feniger and Mary Sue Millikin. The restaurant features new wave Mexican cuisine that is served for lunch and dinner as well as weekend brunch. You will find an atmosphere that is chic with an urban attitude while you gawk at the people around the beach area while you sip that perfect margarita. Standout dishes include chicken poblano enchiladas, plantain empanadas, torta ahogada and asado norteno chicken as well as vegetarian items like cauliflower annatto paella. Weekend brunch serves up dishes like Peruvian shrimp and grits as well as a bacon jalapeno pbj sandwich. When you want to find an upscale Las Vegas Mexican restaurant that combines the tastes of old Mexico City with today’s trendy Mexico City then an ideal place for you to eat is T & T- Tacos & Tequila. 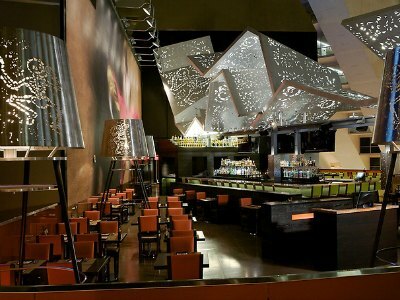 Located within the Luxor, the restaurant is open for lunch and dinner with an eclectic lively atmosphere. The interior is a chic mixture of old and new with murals, brightly colored glass as well as other materials from dark woods to brushed aluminum. The menu mixes traditional style dishes with a new flare towards trendy chic that features items such as shrimp ceviche, stylish combination platters and seafood rellenos. There is also a plethora of taco choices from chicken to al pastor to alambre. Happy hour brings daily specials like $6 frozen margaritas as well as $6 food items and Sunday brunch features a $15 bottomless frozen margarita. 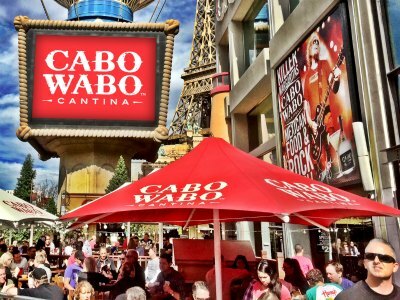 When you want to find a Las Vegas Mexican restaurant that has a diverse menu and a great patio with a view of the Bellagio Fountains then you should try Cabo Babo Cantina. Located within the Miracle Mile at Planet Hollywood, the establishment serves all three meals and is the brainchild of Sammy Hagar former lead singer of Van Halen. Fashioned after the original restaurant in Cabo San Lucas you can expect a laid-back beach feel with a lively crowd while you are chowing down on items like fajitas, short rib beef barbacoa tacos and cilantro jalapeno chicken. Breakfast brings food such as huevos rancheros, classic egg dishes and a variety of pancakes. The view from the patio includes the Bellagio Fountains which will dance for you while you sip on a signature vojito. If you are searching for value then check Groupon for a coupon before going. Photo courtesy of Cabo Wabo Cantina. If you are interested in a Las Vegas Mexican restaurant that specializes in scratch-made food and is a great place to people watch then the Canonita is perfect. 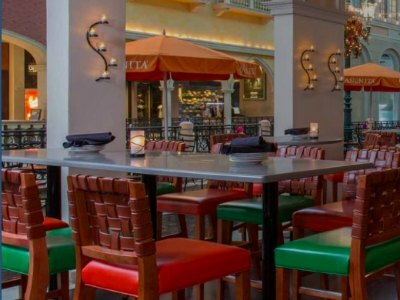 Located along the Grand Canal Shoppes at the Venetian and Palazzo, the restaurant is open for all three meals bringing the tastes of Mexico City to the Strip. The atmosphere is pleasant where you can watch the gondolas go by while you indulge is freshly hand pressed tortillas along with specialty dishes such as cochinita pibil empanadas or pork pozole verde soup for starters before diving into pollo mole poblano, wild mushroom enchiladas or a chile-rubbed shrimp burrito. If you are just browsing the shops at the Grand Canal then try the Street Taqueria where you can taste tacos from chicken tinga to carne asada to pork carnitas and if you hungry for breakfast the braised short rib chilaquiles are great. 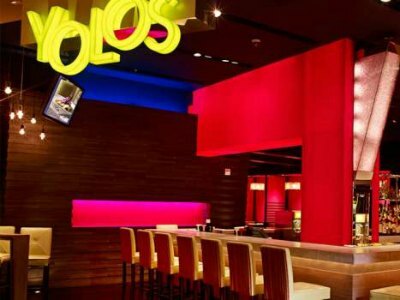 YOLOS Mexican Grill is an upscale Las Vegas Mexican restaurant which has a lively atmosphere, a variety of street tacos, innovative appetizers and you can indulge in 60 different tequilas. Located within Planet Hollywood, the restaurant brings a whole new meaning to fiesta and is open for lunch as well as dinner. 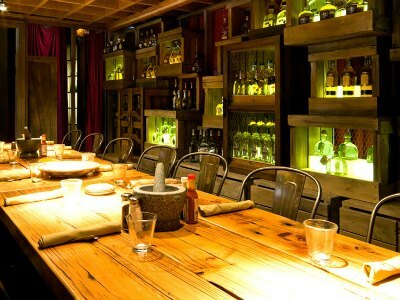 Once inside you can indulge in traditional items like street tacos, burritos, camarones a la diabla, sea bass a la Veracruzana as well as unique appetizers like chorizo sopes, gambas al ajillo and the guacamole fresco is prepared tableside. Vegetarians will be pleased with an assortment of dishes such as butternut squash enchiladas and a roasted vegetable burrito. The bar atmosphere will have you enjoying a signature Pink Cadillac margarita and there are 60 different tequilas for you to swallow. A daily happy hour brings $6 items to the forefront such as margaritas, nachos and tacos. 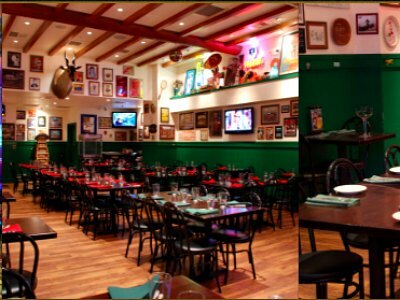 If you are searching for a lively atmosphere in Las Vegas Mexican restaurant as well as a variety of house specials, a separate menu of vegan treats and a live mariachi band then go to Hussong’s Cantina Las Vegas. Located within the Mandalay Bay, the establishment is the first outpost for the original restaurant in Ensanada, Baja California that opened in 1896 and is where people believe the margarita was invented. Open for lunch and dinner, once there you will find a variety of south of the border flavors that will delight your taste buds with signature items such as the huarache, Hussong’s chile relleno, Baja shrimp tacos as well as a variety of tacos, burritos and veggie dishes. The margaritas are a must try while you listen to the mariachi band and happy hour brings value with half-priced margaritas, appetizers as well as tacos. 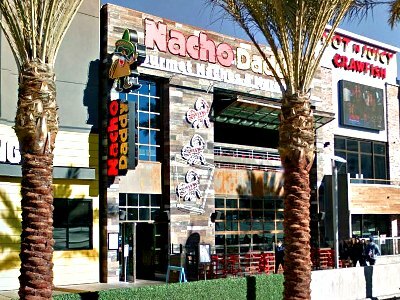 If you are seeking a Las Vegas Mexican Restaurant that specializes in unique nachos and puts a new type of flare towards traditional dishes then the Nacho Daddy is your place to visit. With three locations in the Miracle Mile Shops at Planet Hollywood, Summerlin and the Freemont Experience in Downtown you can revel in dining on some of the more uniquely created plates of nachos and several more traditional style dishes with new zest for all three meals. Families and party goers really like the huge portions and the chance to savor many different flavors while dining. Specialties like the Thai chicken nacho, spicy shrimp nacho and the sloppy joe nacho. You will also find an assortment of traditional items such as grilled corn on the cob, pork enchiladas, fajitas, street tacos and combination platters with breakfast featuring dishes like the bacon cheese enchilada rancheros. 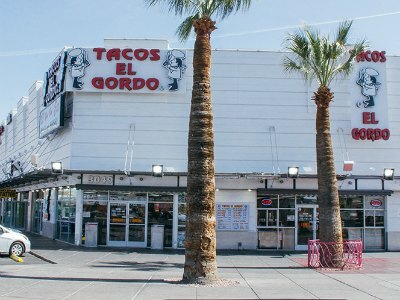 When you want to try original style tacos that are prepared with made from scratch ingredients then a great Las Vegas Mexican restaurant for you to dine at is Tacos El Gordo. With three locations throughout the city including one directly on the Strip, this is a taco eating haven which will have your mouth watering after every bite. Fashioned after a traditional taqueria in Tijuana, this restaurant serves made from scratch salsas and hand pressed tortillas in a variety of traditional tacos that range from adobada to carne asada to suadera as well as exotic tacos like lengua, tripa and cabeza. Other items of note are the sopes, mulas and tostadas that bring a zest to mouth while you are eating. You will find the atmosphere chaotic at times and somewhat like a fast food place put the quality of the food is amazing. One of the more popular Las Vegas Mexican restaurants with patrons looking for made from scratch dishes and traditional street tacos is the El Segundo Sol Taqueria and Margarita Bar. 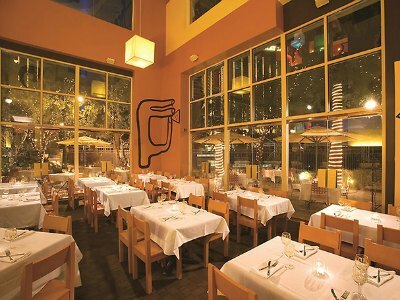 Located within the Fashion Show Mall, the restaurant prepares meals for lunch as well as dinner and offers a comfortable atmosphere with a Strip view. The establishment specializes in made from scratch food which includes hand pressed tortillas used for tacos that include mahi mahi, braised beef, carne asada and vegetarian. Other traditional items such as chile rellenos, an assortment of enchiladas, fajitas as well as several quesadillas, tamales and grilled corn will delight your senses. The bottomless chips and salsas feature three different dipping sauces which is a standout to dining patrons. Happy hour brings an assortment of specials from $3 taco bites to $5 margaritas to $3 shots of tequila.